Tips for a Cost Efficient Kitchen Redo! 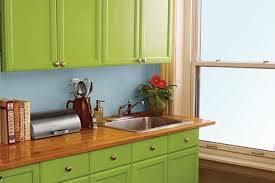 Color can go a long way in transforming your kitchen cabinets. 1. Keep your cabinets! Resurfacing and painting or a new veneer or just new doors can save you a bundle in the long run because new cabinets are the biggest cost in a kitchen remodel. You can also add inexpensive open shelving to add interest to to the space or to go in place of some existing cabinetry. Mixing it up adds depth! 2. Invest in good countertops! But consider breaking up the space with mixed materials. Granite, marble, quartz or soapstone tops are great choices for countertops but add butcher block or a tile mix to add depth to the space and save on materials. Keep that floor plan to save! 3. Keep your appliance floor plan! Moving appliances can be expensive as the electrical changes or mechanics may require a professional. Chests, tables, desks and vanities can double as kitchen islands. 4. Get creative with an island! A cabinet island is grand but you can also repurpose old furniture with a great countertop and add a lot of interest to the room as well as save bucks. Make sure it's countertop height (36 inches) and remember that in some cases you can add casters for height. 5. Open up without tearing down! You can open up a kitchen by creating a cost effective cutout in lieu of tearing out walls. You can avoid electrical issues by doing so and still have that breezy floor plan you desire.